Are video games making kids fat? Screen time and childhood obesity. Are TV and Video Games Making Kids Fat? The effects of “screen time” on childhood obesity. Photograph courtesy Dr. Arlette Perry. Talk about a disparity between theory and practice. The American Academy of Pediatrics tells parents that children’s total entertainment media time should not exceed two hours daily. According to the Kaiser Family Foundation, average kids watch at least twice that much television. They also spend more than an hour per day online and another hour on video games. These activities, collectively called “screen time,” are widely blamed for the tripling of obesity rates in children since the 1980s. Such studies are complicated by the fact that even regular video games—the ones so often blamed for the present rates of childhood obesity—may not be as passive as you think. A decade ago, a physiologist named Arlette Perry at the University of Miami worried that her 10-year-old son Thomas was spending a lot of time with a controller in his hand. 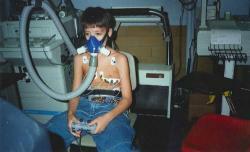 To measure the effects of chronic gaming, she studied her son and 20 other children as they played Tekken 3 on a Sony PlayStation in her lab. She found that the fighting game increased the kids’ heart rates and blood pressure to the same extent as walking at 3 miles per hour. Children burned roughly twice as many calories playing Tekken 3 as they did sitting in one place, which translates to an extra 40 to 80 calories burned every hour. In other words, this traditional, “passive” video game was itself providing children with a form of exercise. If video games aren’t the problem, then what about television? We’ve know for a long time that attempts to reduce television-watching among children have a limited effect on their body weight. For a 1999 paper in the Journal of the American Medical Association, researchers gave a group of third- and fourth-graders in California regular lessons on the dangers of excessive television. Their parents were asked to enforce time budgets (using a device to limit total screen time) and participate in television turnoffs lasting 10 days, among other projects. This very involved, two-month intervention halved television watching among participants. Eight months later, researchers measured the children’s heights and weights, and compared them to those taken from children at a school without a similar program. The drastic reduction in television-watching made for only a very modest difference: Weight gains in the experimental group were reduced by an average of only one pound. Reducing time spent watching television or playing video games may have some benefits—more time for creative play or academic work, for example—but slimmer bodies don’t seem to be among them. It’s also not necessarily the case that increasing screen time will lead a child to gain weight: Between 1999 and 2010, screen time among kids jumped by more than two hours per day, according to the Kaiser Family Foundation. Yet childhood obesity rates remained relatively stable over the same period. Taken together, the data above suggest that public health efforts to cut or reallocate screen time won’t have a huge impact on childhood obesity. There is indeed a well-known correlation between obesity and hours spent in front of a video screen, but the fact of that linkage doesn’t tell us anything about causality. Does watching television make kids fat, or do fat kids just happen to watch a lot of television? The accumulating work in this area suggests the latter. In short, whatever calories a kid might burn off playing Dance Dance Revolution or turning off the TV to go for a walk are small potatoes. Even an adult will only burn off a few hundred calories by working out intensely for half an hour—a benefit that’s wiped out by a single bag of chips or a scoop of ice cream. That might be why taking up dozens of classroom hours in an effort to reduce screen time, or paying to outfit homes with active video games, yield such a small return on investment. That doesn’t mean someone can’t exercise his or her way from obesity to thinness, but the bar is very high. A more efficient way to reduce pediatric obesity would fixate less on the number of calories going out, and more on the number going in. In the end, schoolchildren don’t get obese from mostly watching television. They pack on weight because they eat too much. Consider the results of another major clinical study, in which the families of obese 8- and 12-year-old kids received nutritional counseling, either with or without additional information about exercise. Teaching the parents and children about food habits made almost all the difference: Kids in the study lost around 15 pounds in 6 months, on average, with the extra lessons on the importance of exercise having only a minor impact—a pound or two of extra weight loss. After two years, the effects of dietary changes persisted, at least to some extent; the effects of the exercise teaching remained small by comparison. That’s also why there are no major differences in weight loss among the major dieting programs, like Weight Watchers, the Zone diet, the Atkins diet, and Ornish diet. They all work to about the same degree, because they all reduce the total of what goes in. It’s likely that the kinds of households in which kids watch hours of television per day happen to be the same ones where healthy food options are hard to come by, or ones in which the parents are not well educated in how to make good dietary choices. Though it seems like a convenient cure, just disconnecting the cable service isn’t going to fix those problems.